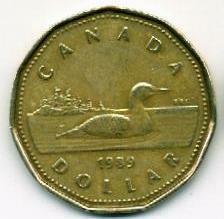 one question...whats a loonie and should I be sporting one in my purse for measurements sake? Thanks for the "heads up" (no pun intended), ehBeth. I always enjoy this sight whether it be Venus or Jupiter. You can't help but think of the star and crescent symbol common in the middle east when you see it. That is a damn fine-lookin' coin, Beth. I'm enormously proud, Gus. Thanks for mentioning it! Ahhhh. The robust patriotism of the Canadians! i saw that last night with my two daughters, we have been able to see venus for a while now. Thanks for the heads-up, Beth. I caught some glimpses while driving to and from the vet. It's cloudy here in VA, USA. But on the "What made you smile today" thread, Nimh talked about his view from the Neatherlands, EUROPE and I responded with everything I could remember from Stardate on NPR this morning about Venus. Ah, seeing the same stars makes the world seem that much smaller. um, weren't you JUST at the vet, Q? um yeah..boarding for the evening/day whilst I have new windows installed today. It was fun to do twice in one week, they certainly adore me for it.